Remember the sneak peek I posted a few weeks back? The one of the quilt I was working on with Tula Pink's new line for Free Spirit, Parisville? Well, several of you called me a tease, and as much as I don't like getting called names, I also recognize that you were kind of right. So in the spirit of being a tease, here are a few more shots of the quilt, freshly returned to me from my quilter, Bethany. I'm binding, binding, binding away on this quilt, and then it will hit the road on its merry way to ... ??? Wow, that's beautiful. The stippling is just gorgeous. Love the fabrics you chose, too. Quiltmarket? It's gorgeous,what we can see of it! 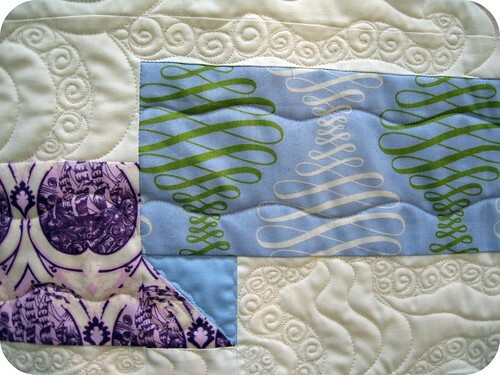 I'm intrigued by your design and the quilting is perfect! Beautiful tease!! I love this new fabric line. Thanks for the closeups of some original and inspiring quilting.Can't wait to see all of this quilt. No wonder you have Bethany do the quilting, she is quite the artist! I can hardly wait to see the whole quilt. I'm loving the colors! Can't wait to see the whole quilt. That is so beautiful! I can't wait to see the whole thing. you're still a tease...but holy moly, the quilting on that sucker is wonderful! Beautiful!! Are you going with it? I would love to meet you. Wow, wow, wow, wow, WOW! Can I guess the pattern is something like....ribbons?? Love the last shot - the quilting is superb! Tula is so unique, don't you think? It's gorgeous John! I so wish I could be there (and yes, I totally know where you're talking about) to see it myself. So sad I won't get to see you again this year, but maybe in May in SLC? 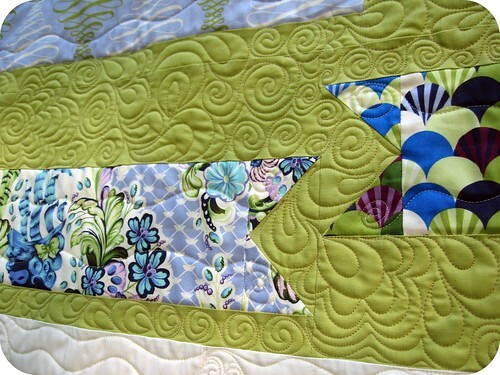 Oh WOW...that colors and design I can see are gorgeous and the quilting is truly STUNNING! wow, the colors are so me. the quilting is amazing. Oh gorgeousness! I'm saving my pennies for this line of fabric. Looks like you've done an amazing job with it! That quilting is absolutely gorgeous! I am quite impressed. I cannot wait to see it finished! What a gorgeous quilt. The fabrics are lovely and the quilting is stunning. Love it...ordered the entire collection for Wish Upon A Quilt...wonder if we could borrow the quilt for a bit? 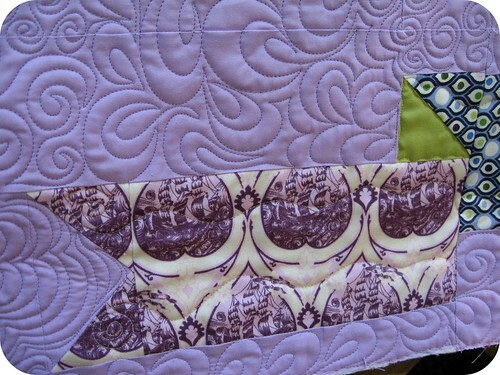 Just ran across your Parisville quilt on Jaybird's blog. Really stunning! I love that blue colorway. Fabulous design, too! :) BRAVO! Your quilting is fabulous. You have a incredible eye for matching design and color. Can you show us the whole quilt yet John? I would love to see it fully - maybe a pattern?? ?